If you’re a parent looking for quick tips to help your children grow as readers and writers, then you must visit Raising Happy Readers. Ruth Edwards’ site is full of gems like 11 painless tips for teaching handwriting and a series of posts to help kids understand what they read, along with links to the best literacy posts from around the blogosphere. I’m so thankful to have her guest posting today while we enjoy our new baby girl! I am so excited that Anna asked me to share my thoughts on how to develop children’s vocabulary! Kids start learning language and words from the day they’re born, so it’s never too early to learn some easy steps to enrich their vocabulary. In the picture above, my one-year-old son and I are at a farm talking about sunflowers. People have been amazed at his extensive vocabulary since he started talking, and now that he’s six years old I feel like my approach has been field tested successfully! Thankfully, my teaching background and expertise in the field of early childhood literacy also back it up. 1. Research shows that the stronger the vocabulary, the better kids do in school. A child from an upper middle class family enters kindergarten having heard approximately 45 million words, whereas a child from a poverty-stricken home enters with merely 13 million. It’s not a big surprise that the kids who come from homes with lots of language and words learn how to read more easily and do better with their studies in school. 2. A strong vocabulary helps improve listening comprehension, social conversations, writing, and the learning of specialized subjects. Trust me, a great vocabulary is a very valuable gift to give to your child! a. Talk to your baby. Babies learn the rhythm of language and how to take turns in a conversation. Making eye contact and letting them have a “turn” in the conversation makes them feel like a real part of things and helps their confidence soar. b. Have all kinds of conversations. Researchers have found that children pick up rich vocabulary from you while you’re chit chatting. Families without much language in their homes tend to only speak for business reasons – “Eat your dinner,” “Put on your coat,” “I’m going to work,” etc. But when you start talking about interesting things you’ve seen or done, new words pop up everywhere! c. Talk about what your children are doing. Add words to their experiences as though you are a T.V. commentator. For example, “Look at you! You’re rolling on the floor! Ouch, did you hurt your head? Let me move you over here away from the table.” Each time you talk is an investment into their vocabulary bank. d. Instead of correcting mistakes, model proper language. 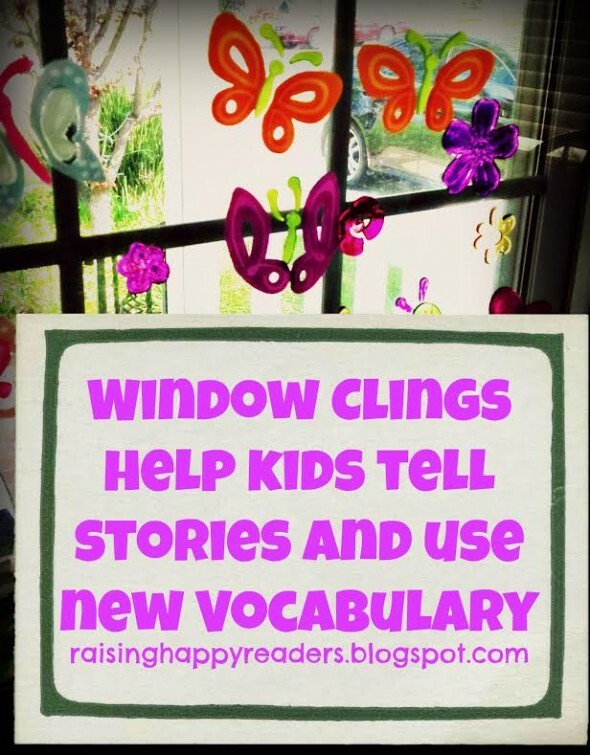 You can check out my post Using Window Clings for Literacy for a super simple idea for encouraging talking. Tip #2: Make Reading Come Alive! a. Make read aloud an interactive experience. There is enormous power in reading aloud to learn new words. Make this interactive by asking questions, praising your child for paying attention, noticing new words, and following your child’s lead to see what he or she wants to talk about. If you need help with prompts, use my free printable tip sheet for reading at home. If you’re the parent of a toddler and thinking there is no way you can even get him or her to sit still long enough to read a board book, I feel your pain. 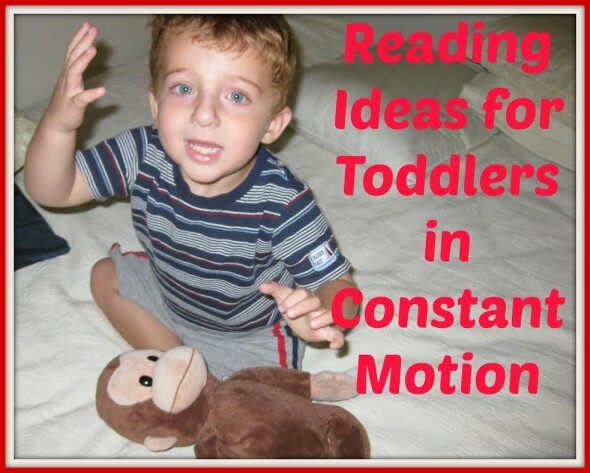 Check out my post which shares eight useful tips for reading to busy toddlers. b. Read language-rich picture books. Rich, gorgeous picture books have the best language available. I am a big fan of Chris Van Allsburg, Jan Brett, and Rosemary Wells picture books (see the above widget for some top picks!). Here’s a neat list of books to build vocabulary over at Pragmatic Mom. a. New experiences don’t have to be expensive or far away. The best thing you can do is to encourage naming lots of things and actively exploring with their five senses. This particular experience (pictured above) allowed us to use lots of color words, texture words (ooey, gooey, messy, smooth, slippery, wrinkled), and directional words (over, under, beside, around). b. 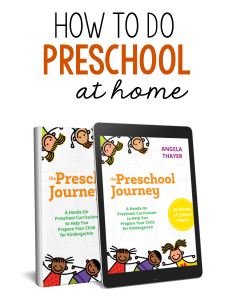 Everyday adventures/experiences could include arts and crafts, cooking, the grocery store, post office, bakery, restaurant, park, errands, the library, doctor’s office, etc. c. Infrequent adventures/experiences could include farms, hiking trails, oceans, beaches, pools, vacations, festivals, carnivals, amusement parks, concerts, rodeos, pony rides, zoo, museums, etc. a. Try to always have the time to take your child seriously and answer questions about words. b. Ask your child about a word he might not know. Be sure to follow up with, “Okay, tell me what it means.” This helps you double-check that your child is on the right track so you can help clear up any misunderstandings. The other component of encouraging curiosity about words is collecting some favorite words on index cards at your house or helping your child make creative word choices while writing. You can take a look at The Measured Mom’s post Help Young Writers Build Vocabulary: Put Boring Words in Jail! to help you get inspired for your young writers. I also love Home Literacy Blueprint’s vocabulary investigations. a. 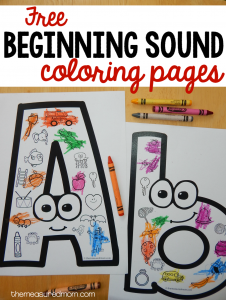 Read and sing nursery rhymes, songs, and poems. My post Lazy Summer Reading Ideas shares a number of reading games. 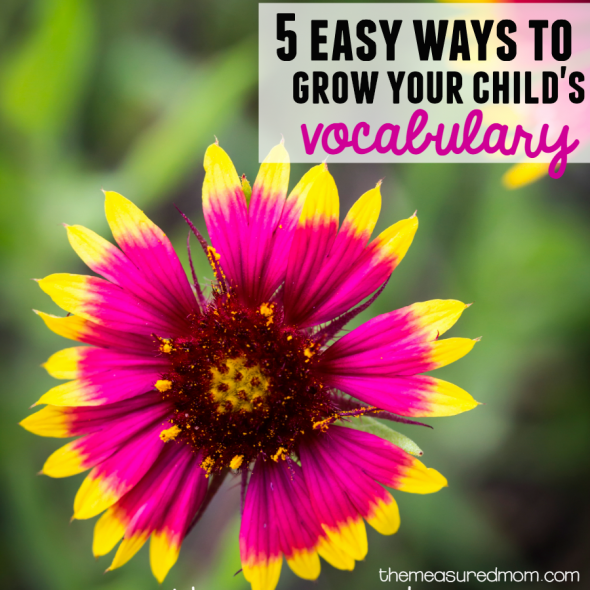 Vivacious Vocabulary and Muffin Tin Games are from the blog Growing Book by Book. A great game mentioned in the excellent book Games for Reading by Peggy Kaye is as simple as each person naming something they see (maybe while you’re waiting at the doctor’s office). 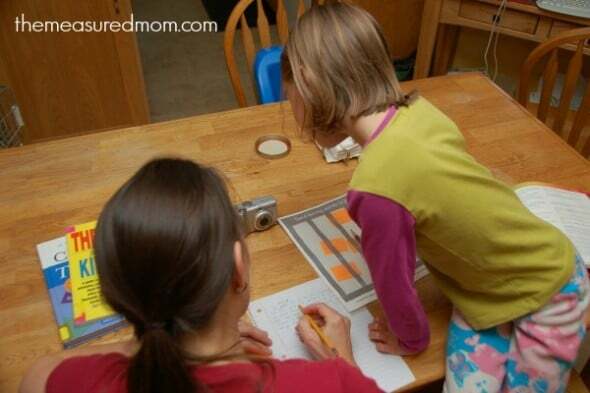 Your child might mention something simple like a table and then you point to it. You pick something that might challenge their vocabulary knowledge a little bit like vent. If they can’t find it or don’t know what it is, you can point it out to them. Now you know some easy tips and tricks to make learning new words a breeze. 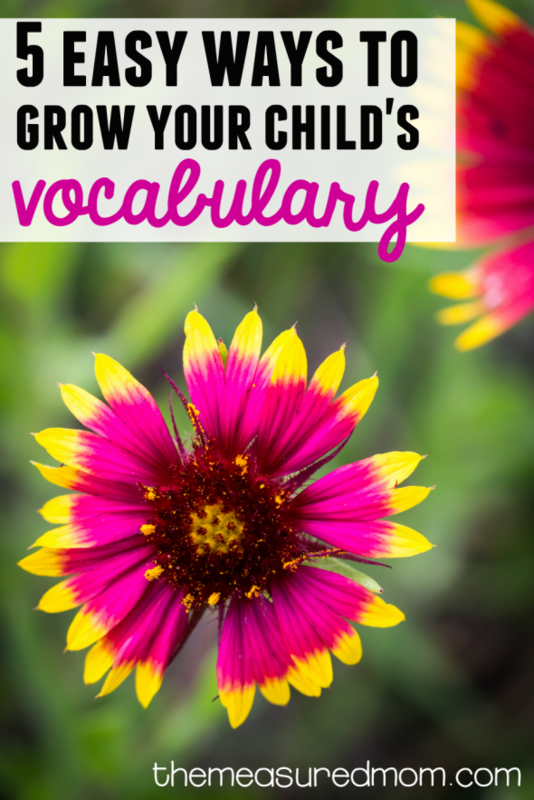 I hope that you enjoy watching your child’s vocabulary bloom! 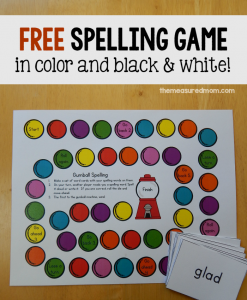 Please share if you have other ways of discovering words at your house! Before becoming a stay-at-home mom, Ruth taught in kindergarten and first grade classrooms for over eight years. She holds her certification as a Reading Teacher as well as a Master’s Degree in Curriculum and Instruction with a focus on Early Childhood Literacy. Now that Ruth has a six-year-old, she deeply understands busy parents’ need for quick activities to raise readers by working smarter, not harder. Ruth shares all of her finds and expertise on her blog Raising Happy Readers. 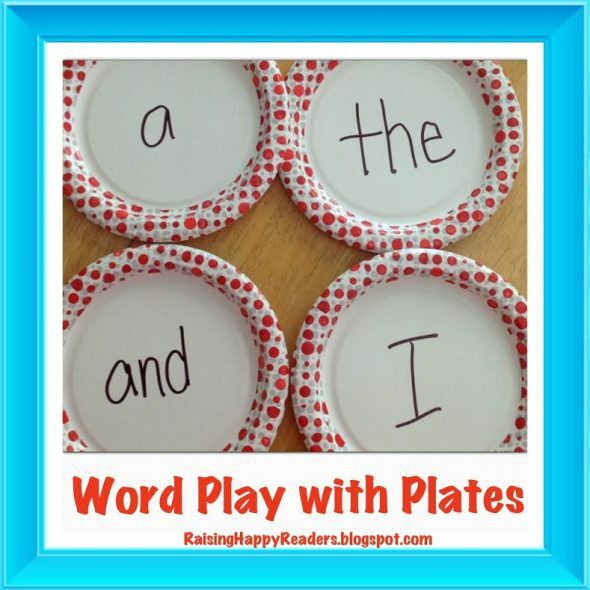 She also pins lots of great literacy resources on her Pinterest boards. These ideas are great! Thanks for the encouragement. Sometimes all I want is peace and quiet, but all this toddler and preschool conversation is so important. Thank you!! I know what you mean, Kate!! My son is such a chatterbox, too. At least you know the loss of our sanity is going to a good cause:) I also try to encourage lots of opportunities for them to talk to OTHER people while I get some peace and quiet. Wonderful advice on one of my favorite topics! Thanks so much for including my muffin tin reading games. Hi Anna. Thanks for this post. These are all great ideas. I can definitely relate to the active toddler. He loves his books but he has trouble sitting still for even the shortest board book right now. If he gets up in the middle of the book, I just finish it as he’s toddling around and, more often than not, he’ll then bring me another book! Good for you for working at it, Cassie! My toddler had very little interest in books for quite some time. I read a book or two here and there, but now at age 2 he’s suddenly interested in long reading sessions on my lap. Just have to keep at it! Thank you for the invite to your linky party, Angela – as you’ve noticed, I’m a bit behind these days. I am finding it difficult to link up even to my regular parties with a newborn in the house. I’ll check out your blog! Great post! Excellent ideas, very well organized, and specific ideas with easy to follow steps. Very nicely done! I’m a firm believer in everything you wrote in this post. I talked to my daughter all the time using rich vocabulary from the time she was born. I used to get so upset at people that talked to her like a baby. Actually when they did, she usually had no idea what they were saying lol. Sometimes she would say a word incorrectly like banana, and people would think it was cute and try and use the incorrect word with her for their amusement. I had to chat with a few about this. But the rewards were there, she was an early talker and uses some pretty impressive vocabulary. I agree in no baby talk, Melanie. An interesting thing to note is that doing all these things is no guarantee of an early talker. I read to my oldest ALL THE TIME, and we took her places and talked to her constantly. She spoke not a single word until she was almost 2 1/2! Everyone told me she’d talk in sentences when she started… nope! It turned out she was on her own time schedule, though, because once she started she quickly advanced to her age level. She was reading fluently before kindergarten, and now at almost age 7 speaks very clearly and expressively with a great vocabulary. We just had to trust we were doing the right thing and be patient! Point taken, Anna Geiger. You are right, it is no guarantee, every child is different and has their own timetable. Every child will have their unique strengths and timetable. I do believe in my daughter’s case, my obsessive talking to her greatly helped her being an early talker. I was a single mom, it was just her & I living together, so she had my exclusive attention. Everything I did, I explained to her, and showed to her. I talked to her whether I was pushing her in a buggy or doing dishes, I was constantly talking. In her case anyways it greatly helped her being an early talker. Thanks, Melanie – and I do want to say that I wholeheartedly agree that what you did led to your daughter’s being an early talker with a great vocabulary! Kids can’t use big words unless they hear them – whether in conversation or from books. That’s such a gift you’ve given your daughter! Wonderful post with great tips! I have been reading up quite often in the past few months on this topic. Our eldest son aged 20 months is having some problems with speech development. We will continue to work on this and hopefully see improvement soon! Sounds great, Bismah – you might also want to blogs written by speech therapists. Here are some you might find useful: http://www.two-daloo.com/, http://www.playingwithwords365.com/, and http://thelittlestories.com/. 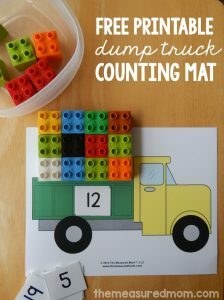 After browsing Pinterest and seeing worksheet after worksheet idea aimed at children as young as toddlers, I was expecting something equally inappropriate when I clicked on this Pin. I am so thrilled to be wrong! Thank you for a common-sense, developmentally appropriate approach to helping children grow into accomplished readers and writers. I will gladly share this. Thank you, Penni! 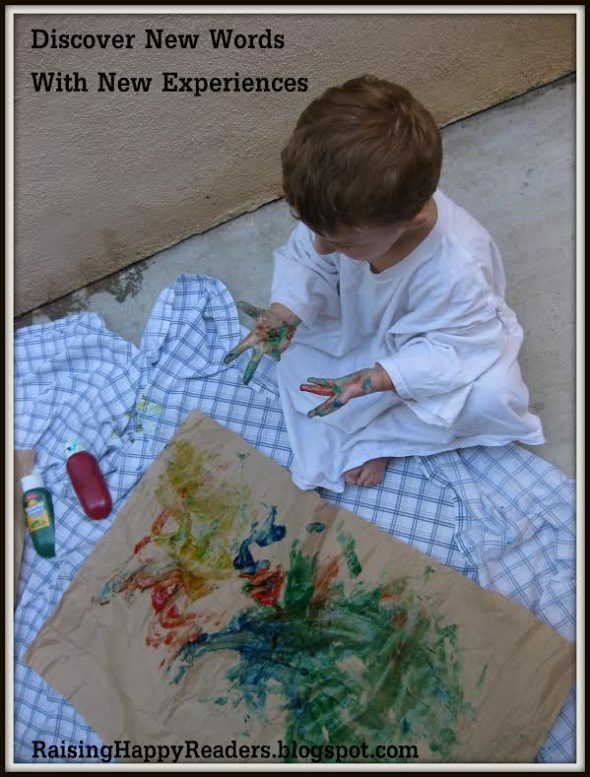 I agree that worksheets should be used sparingly (if at all) with young children. There’s so much our children can learn just by listening to books and experiencing the world. I’ll pass your kind comment on to Ruth, who guest posted for me and wrote this post. Thank you so much, Penni!! It is very kind of you to take the time to let us know. I wholeheartedly agree with you and Anna. I think it’s also helpful for parents to see that they are actually having learning experiences all the time with their kids without pulling out worksheets. We’re so hard on ourselves as parents that we don’t give ourselves any credit unless we can prove it with a worksheet! Thanks again and happy talking!